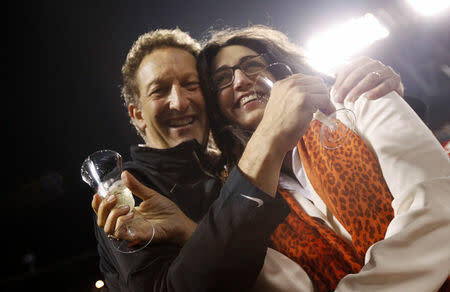 San Francisco Giants CEO Larry Baer won't face criminal charges stemming from a public incident with his wife on March 1, the San Francisco Chronicle reported Tuesday. Baer took a leave of absence three days after the incident in which he was seen pushing wife Pam to the ground. The incident was caught on video and initially released by TMZ. "After a careful review of the relevant evidence, including multiple videos, statements from several witnesses and the parties themselves, the evidence does not support filing criminal charges," district attorney's office spokesman Alex Bastian said in a statement to the Chronicle. Baer still could face punishment from Major League Baseball under its domestic violence policy despite the absence of charges. On the day of the incident, the couple reportedly were having a loud argument about a cellphone when Baer knocked his wife, Pam, out of a chair and down to the ground. Pam Baer is heard in the video screaming, "Oh my god. Help!" Larry Baer walked away -- with the phone in his hand -- while saying the following: "Stop, Pam. Stop." Both Larry Baer and Pam Baer released statements later that day saying a foot injury Pam had recently suffered led to the fall. Larry Baer admitted his behavior was " inappropriate." San Francisco mayor London Breed called for Baer to be suspended earlier this week. She expressed that sentiment in a letter to MLB commissioner Rob Manfred. "While Mr. Baer has apologized and expressed remorse for his behavior, it does not excuse his actions and it does not erase what transpired," Breed wrote in the letter to Manfred. "Mr. Baer's actions were serious and wrong. We are a City that loves and supports our San Francisco Giants, and that means holding our organization and its leaders to the highest of standards. "Every little girl, every woman should be able to attend a Giants game with a clear sense of the organization's values." Baer has been in Giants upper management since 1992. He became COO in 1996 and later was elevated to team president before becoming CEO in 2012.